• Spirit Wear Orders – One Week Left for Orders! Sizing Kit in the hall. We will be celebrating Earth Day on Friday April 21st. We are turning it into a day of discover, stewardship and learning. We are asking families to donate cardboard boxes, rope, tubes, old tires, anything that they thing would be useful to build a fort or just for creative play. It is only going to be as good as the items that are brought in. We are very much looking forward to the day! During the Holy Thursday Retreat on April 13, students will be sharing a lenten lunch consisting of rice cakes, tortillas, pita, rye and wheat breads to remind us of the many people from all over the world who belong to our faith community. Students are to bring their water bottles and a substantial recess snack to school but will not need a lunch. If you have any questions, please contact Mr.. van der Pauw, Mrs Kosman or Mrs Peck. 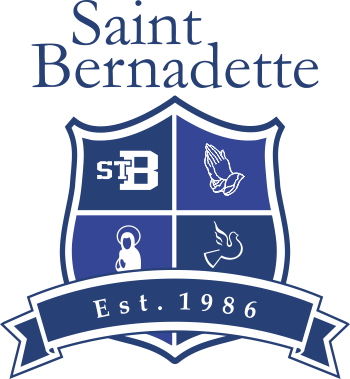 St. Bernadette Track Meet – Thursday April 25th – All Day – Concession Stand and handing out ribbons at the finish line. There has been good interest in our Spirit Wear clothing items for parents. Cambridge has agreed to extend the sale until April 21st. Please stop by the school to see a sample sizing kit near the front office. It is a great way to show your school spirit!If paying by cheque, please make cheque payable to Cambridge Uniforms.